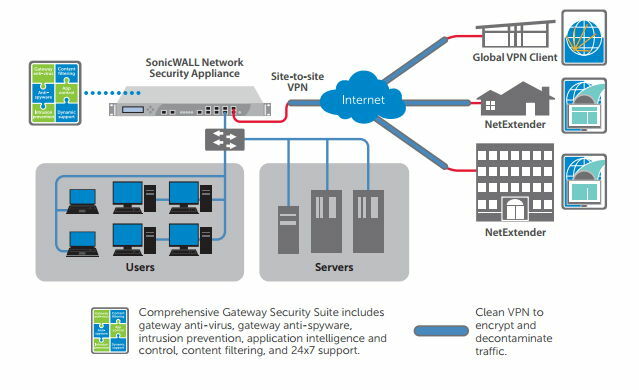 The Global VPN Client provides an easy-to-use solution for secure, encrypted access through the Internet or corporate dial-up facilities for remote users as well as secure wireless networking for SonicWALL Secure Wireless appliance clients using SonicWALL’s WiFiSec technology. Enhanced layered security is enabled when a Dell SonicWALL Network Security Appliance uses powerful deep packet inspection technology to scan VPN traffic for malicious threats, such as viruses, worms, Trojans and spyware. The combined solution is known as Dell SonicWALL Clean VPN*. Dell SonicWALL’s award-winning Global Management System (GMS) provides simplified management of Dell SonicWALL VPN Client connections. By connecting from any single or dual processor computer running one of a broad range of Microsoft® Windows® platforms. Further extending secure remote access, the Global VPN Client enables encapsulated VPN traffic to traverse any IP network using Network Address Translation (NAT). Provides simultaneous Global VPN Client connections that can be established to multiple Dell SonicWALL VPN gateways. The Global VPN Client supports redundant Dell SonicWALL VPN gateways to ensure mission-critical network access in the event the primary gateway fails.